Naren is a dreamer and a people lover. An unshakable optimist, he strives towards building a better world where everyone has a beautiful story to tell. He strongly believes that incredible parenting can change every human being’s life journey to something phenomenal. And that is his “Why” for building Wow Parenting. A doting father to three dream-like kids, he brings you all his passion, insights, and lots of love in our online parenting course. 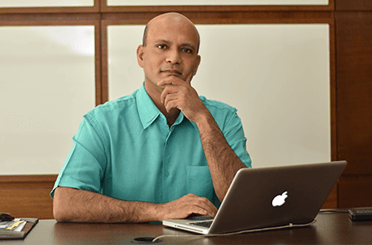 As co-founder of WOW parenting and Life School, Naren has been conducting inspirational training programs for people from all walks of life, since past 18 years. His inspirational trainings are guided by his principle of helping people lead an Empowered Living/Life. His Parenting training sessions have inspired numerous people, the stories of which you will read here. Naren also runs a powerful social initiative called the Keep Moving Movement that trains volunteers to inspire teenage school kids toward courage, leadership and the ability to do exceptionally well in life. This love of Naren’s toward transforming children brought him to start WOW Parenting, a portal with an online parenting course that can change the way you even look at parenting. With an aim that amazing parenting will only help create incredible adults, Naren leads this initiative to ensure that you parents get the best out of this. Now access all course content on your fingertips and learn at your pace. Download apps on your phone and stay updated with the latest parenting-related content like tips n tricks, blogs, videos, and webinars. Peak Performance In Academics: If “How do I make my child focus on studies?” is a concern on your mind, then this chapter is what you need. Here we explain how to make your child focus well on studies and perform exceptionally well. Building Self-Esteem In Your Child: The development of self-esteem starts at home. Parents can make or break things for children. In this module, we will see how parents shape or break their children’s self-esteem. A Role Model & More: Have you ever been curious to know if you are parenting your child really well? Have you ever been curious to know what qualities lead to exceptional parenting? You will find the answers in this module. 8 Critical Abilities Needed For the 21st Century: We aren’t exactly born with superpowers. We build them over time. Why not build some superpowers in our kids and equip them to take life head-on! Surprising Requests Of Your Child: Ever wondered what makes your kid believe that he will be super successful? This chapter talks about the 12 unsaid requests coming from the heart of your child which makes them believe that they will be a champion at what they do. All About Effective Communication: How can I learn the right way to communicate with my children? How do I learn, what to say, how to say, when to say? How to make children listen to parents? "Perfect Parenting" For An Exceptional Child: Let’s explore some seemingly simple aspects of parenting that when done right, can help you practice perfect parenting. These are unique insights that are NEVER focused on. Understanding LOVE: Love makes kids blossom. Love is the fertilizer to their souls. Is your child silently telling you something about not feeling loved enough? This chapter points out some easy ways to let your child know that you love them. The Way Celebrities Were Parented: Do you know how the core habits and skills of celebrities were formed? It had to do something with the way they are parented. This exclusively interesting series of videos bring you useful quotes and tips from the celebrities themselves. Here you’ll learn what it takes to raise a child that holds the potential to become a celebrity in the future. It’s all about celebrity parenting!